Sergeant Paulino Reyes is in the spotlight once again for yet another shooting, and this time it involves a civilian. The incident happened in the Valley of Peace Village in the Cayo District. The victim is 53 year old Donatilo Canales. Canalez claimed that he was shot by Reyes twice and remains at The Karl Heusner Memorial Hospital (KHMH). Canales, from his beside at the KHMH told Channel 5 News on Tuesday November 13th that he was shot by Reyes, who was out of uniform. “Yesterday, I was in my yard. I had just reached from my work and some friends arrived in a vehicle. They said they wanted to have a conversation with me so I came outside. When Mr. Reyes was passing by, I told [waved] him “bye”. He stopped the vehicle and asked me why I was doing bad signals to him. I said ‘no I am not doing any bad signals, I am telling you bye’. He pushed me on my chest and then he took out his gun and shot my right leg. When I dropped on the floor, then he shot my second leg and then he hit me with the gun on this part of my head. He pointed the gun on my forehead twice and he told me he wanted to kill me...He grabbed me from my shirt, dragged me to back pan of the vehicle and then took me to his mother’s house. I was bleeding a lot. I asked him please help me. He told me ‘die’,” said Canales. According to the official Police report given by Sergeant Paulino Reyes, an officer attached to Special Branch Unit at the Belmopan Police Station, he was at Valley of Peace village when he saw Donatilo Canales standing on the street side. Canales, who police say is a known drug dealer in the village, was asked by the sergeant to move away from the street because he was loitering. According to Police, Canales allegedly became aggressive and threw a punch at Sergeant Reyes - hitting him in the jaw. According to Sergeant Reyes, he drew his service 9mm pistol and fired a shot at Canales’ left leg in self defense. Reyes says that the gun got jammed and he knocked Canales on the head eventually subduing him. Readers may recall that in March of 2010 Sergeant Paulino Reyes made news after he shot Corporal Gavin Sanchez eight times in the San Pedro Police Barracks which is located behind the San Pedro Police Station. In June of 2011 a coroner’s inquest found that Reyes acted in self defense. Police have not indicated if Reyes will be placed under interdiction or if in fact any official police investigation has been launched. 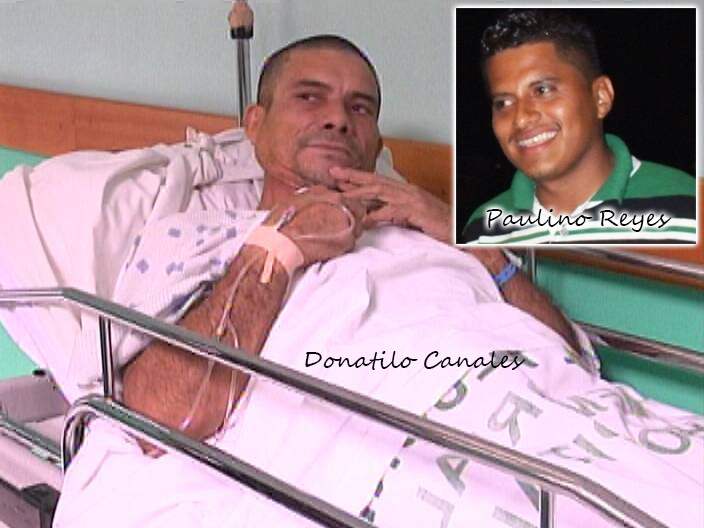 Donatilo Canales remains at the KHMH where he is recovering. Do we speak, or hide the truth?